A powder coated bottom mount bracket blends with these Lazy Daisy� Polymer Pie-Cut Lazy Susans by Rev-A-Shelf when installed in your kitchen. Sold in 2-tray sets, these lazy susans have 8mm steel pin locking trays that keep the doors aligned & require no adjustment. The trays attach to the door and the height can be adjusted easily with one hand. A stop mechanism is concealed underneath the lower tray. 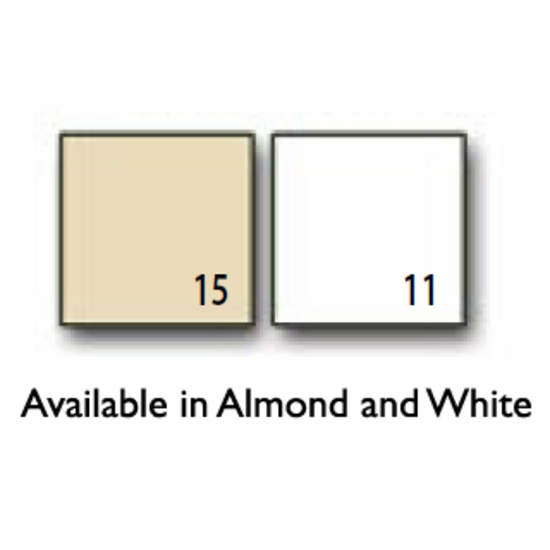 Available in white or almond finishes, these lazy susans are made of high-impact resistant and anti-static polystyrene. Purchased replacement lazy Susan to replace existing broken one for corner kitchen cabinet. Easy to install,good quality and so far so good after a week. Great product and easy to install and each shelf can hold 100 lbs. My old doors installed on this new Lazy Susan perfectly. Product replaced original broken parts perfectly. The price was right and it arrived in a few days. Instructions were clear and it was very easy to install. Very nice product that was fairly easy to install and adjust. Heavy Duty and does the trick. Kitchen Source's customer service and delivery time are outstanding! Very good product. Instructions could be slightly better. Exactly as described and so easy to install. I love the auto stop feature, too. Our original lazy Susan cracked and I was having trouble locating the right size locally. Ordered this product and wasn't real confident that it was going to work. Good quality, relatively easy instillation. Very happy that it worked for us. BTW, good quick delivery from kitchen source. This item holds approximately 30 lbs per shelf. Yes, it can be installed without attaching to a door. It's not a requirement in order for it to function, it will still turn. The shelves attach to the door, so they do not independently rotate. 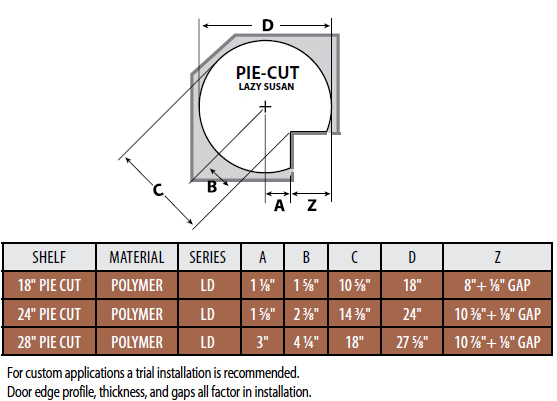 Pie Cut lazy susans are used in L-Shaped corner cabinets where the door needs to be attached to the shelf and spin back into the cabinet.